So much for blogging once a week, but we have been busy. I know, you have heard that before. Janice flew to Utah two weeks ago. Her son and daughter-in-law graduated from college and the next day her daughter Nellie, our trusty helper, had her open house. Janice stayed a couple of extra days so we could finish sewing the new quilt from Moda's Authentic collection. It is being quilted as I write. 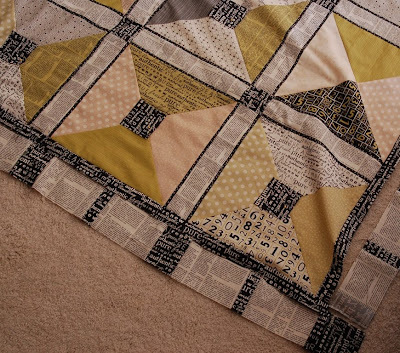 We love this quilt. Here are some sneak peaks of the almost done quilt. The fabric arrives in stores in September and so will the pattern. We should have it on the website early next week. So you can have some things to look forward to, starting tomorrow, we will be creating the illusive computer bag. While brainstorming for that, we found a design for Laura Gunn's (Michael Miller fabric) new line Lantern Bloom. We love this fabric and it inspired us with a great new purse. Previews coming soon. 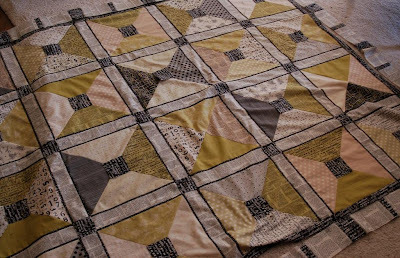 We are also working on new quilts with three Moda Designers, Lila Tueller, Sanae, and Momo. Sometimes we feel so lucky to see all the great fabrics early. We also took a peak at Sandy Henderson's new line, (Michael Miller), and it is BEAUTIFUL. We are going to use it in our first ever, official bed spread. Can't wait. So much to do, so little time. I took a break this week and we met some friends who flew into Las Vegas. We drove up through Southern Utah and went to Zion, Bryce Canyon and Lake Powell. We did hiking, off roading (had a tire blow out), boating and all kinds of fun things. The good news, I took 300 pictures before my camera broke. That is the bad news. I wanted to share a couple of pictures with ya'll. The scenery was breathtaking. 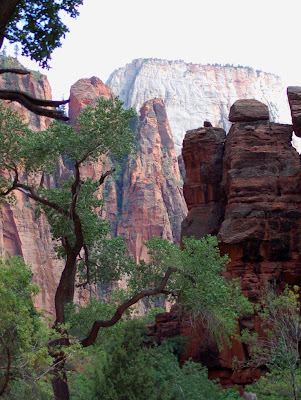 Our first stop was Zion's National Park. I couldn't resist taking pictures of all the beautiful sunflowers. 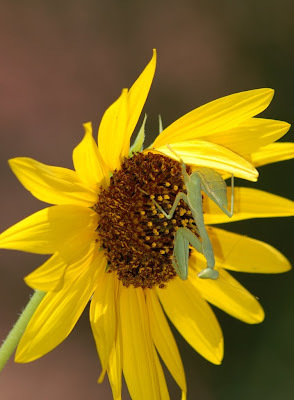 I caught someone else who was also checking out the flowers. 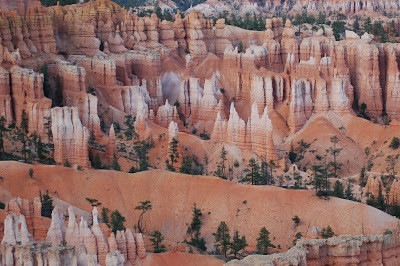 Our next stop was Bryce Canyon National Park. All those little spikey things are called WHO DOO'S. Along the drive we saw tons of them. Here in fact is a whole family. 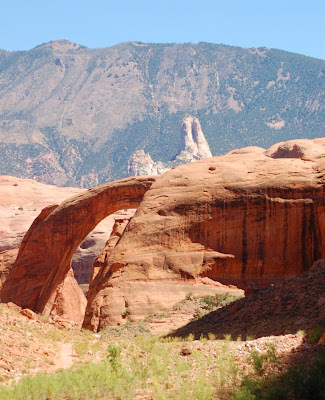 We put the boat in at Lake Powell and headed down to Rainbow Bridge. You can see it peaking around the corner in this picture. It was about a 100 mile round trip. 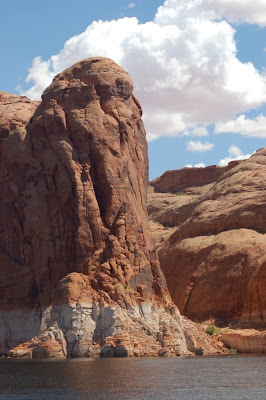 Lake Powell is surrounded entirely by Red Rock. The scenery is constantly changing up and down the lake. Here is one more picture. Hope you enjoyed the vacation photos. I just had to share. Have a great week. Can't wait to share with you all the upcoming projects. Love the new fabric line and can't wait to see it in the stores. 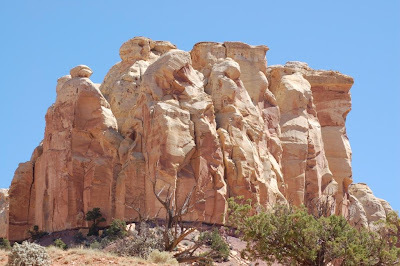 Your canyon pictures are so cool - great ideas for an art quilt. Is that the newsprint fabric in that quilt? If so , could you share the source? I have been dying to buy a pice but I cannot find it anywhere.